I have to admit, it's pretty cool living close enough to Paris to go to the city just for the day. A 2 hour train ride and we're there. TWO HOURS! That's it. It's almost perfect. Perfection would be living in Paris. No, perfection would be living in Paris with good hair that never frizzes. How do French women do it?! Of course, we needed to go while my mom was here. I swear every woman needs to visit the Eiffel Tower at least once in her life. (Warning: once you see it, it's not such a big deal the second or third or tenth time, so really enjoy that first trip.) Mike couldn't get any more time off and he's already been to Paris so this is the trip he decided to skip. 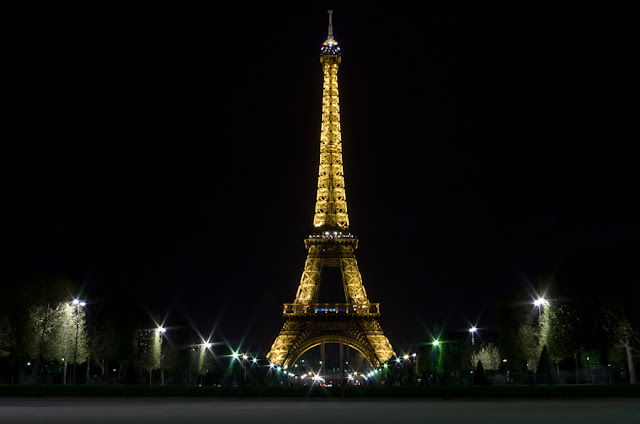 We arrived on the 2100 train, so it was already dark, thus the midnight picture of the Eiffel Tower. And even though she was tired, I made us take a convoluted metro route to our apartment so that we came over the river on Line 6. If you're watching out of the left side of the train as it pops over the bridge (this line goes above and below ground), you get a magnificent view of the Eiffel Tower. It was even more magical all lit up at night. It's my favorite way to see the Tower for the first time. If you're planning a trip to Paris and are interested in doing that, make your way onto Line 6 from Trocadero towards Bir Hakeim. Don't forget to stand near a window! From around the neighborhood we stayed in... except for the Opera House, bottom right. That was near the Starbucks we went to. Every time I go to Paris I fall in love with it more. Every time I find some little nook somewhere that feels good. I just like the vibe of the city. It was great getting to share that with my mom. This time my favorite spot was the Jardin du Luxembourg. I could have spent all day there. We stayed for 2 nights in an apartment I rented online. I love this way to travel! 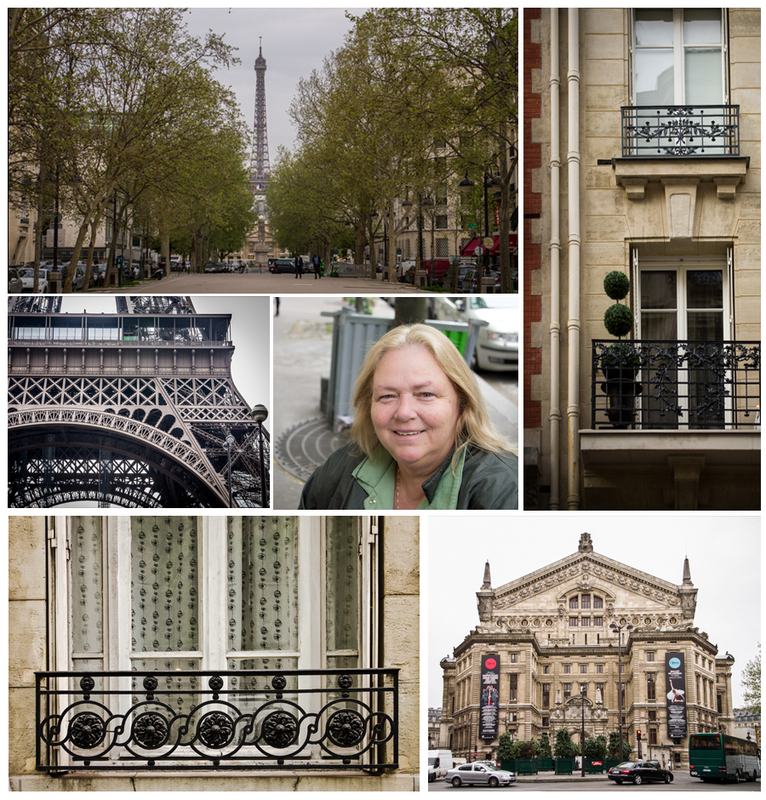 While the apartment we had in Paris wasn't the greatest (it really did not match up to the pictures I saw), it is so nice to have a real place to come "home" to while traveling. I love having a kitchen to make a quick bite to eat and I like being in a residential area versus a touristy district. I'm a super nerd and I just love seeing how other people live and experiencing that by "living" in a real Parisian apartment was a total geek out moment for me. I think I could happily spend a week or so in Paris, but honestly if you're mainly interested in the highlights 3 days is more than enough. My mom was not very interested in the museums, so we skipped The Louvre except for taking pictures of the pyramids. 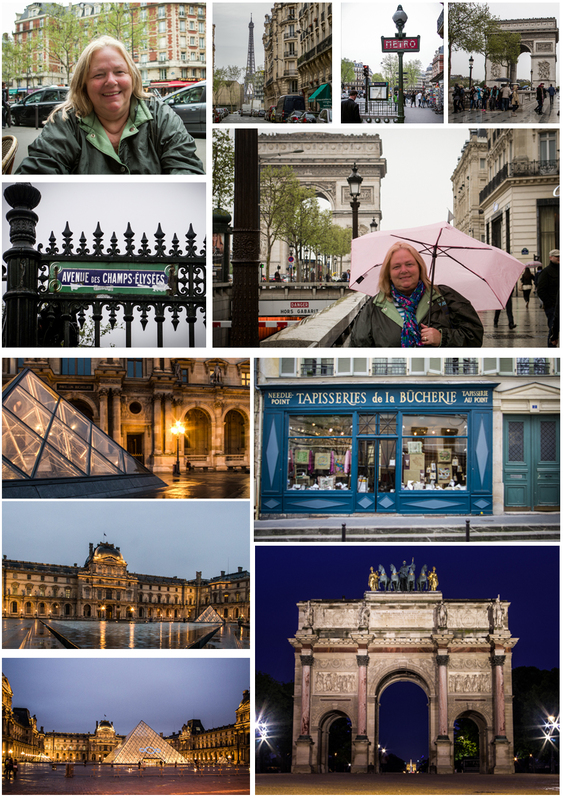 I've heard mixed reviews of The Louvre, but I'd still like to see it and decide for myself if it's earned all the hype. I also want to visit the Musee d'Orsay next time I go. And maybe see a show. Unfortunately, we had more crappy weather on this trip - welcome to Europe in the Springtime! I think after a few days my mom just gave in to frizzy hair and wet feet. It's all you can do, really. 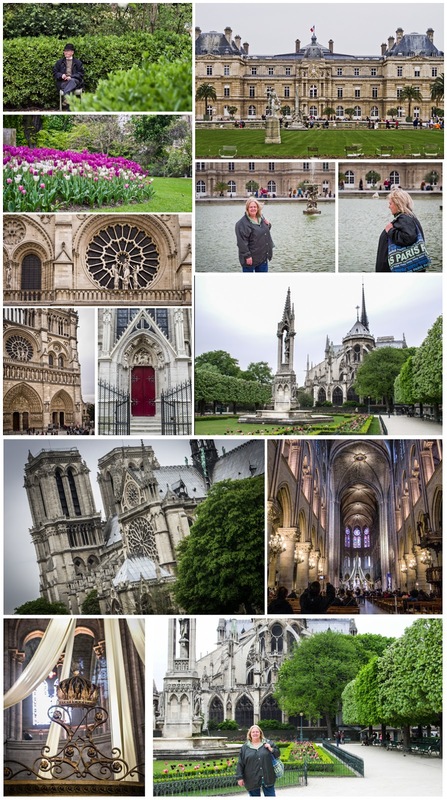 This was also the first glimpse she got into how much walking a trip to Europe entails! For what it's worth, I did feel really, really terribly about the blisters! Love you, Mom! The weather turned even worse on our last day there. On top of the drizzly rain, it turned cold. Being soaked to the bone is one thing, being soaked and cold is another. 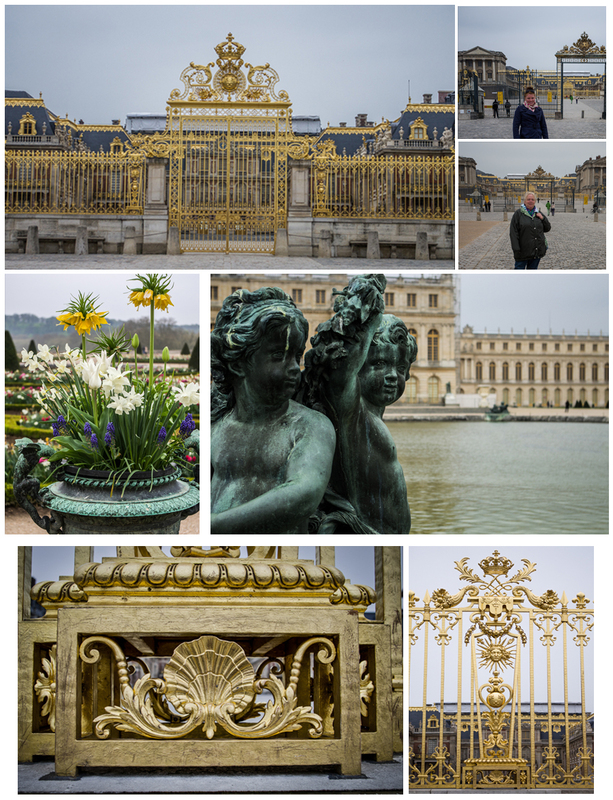 That was also the day we took the train out to Versailles. That was also the day we found out everything is closed because it was a French holiday. Yeah. Score. This is another prime example of where a little bit of research and planning could have made a huge difference. I have a bad habit of just booking train or plane tickets and a place to sleep and not really doing any other planning. I don't research cool places to go or fun things to see. Mostly, we just go and walk around and hope to see something worth seeing. We haven't been too disappointed yet, but I frequently have moments like this where, in retrospect, I wish I'd put a little more thought into it. I feel really badly that I "wasted" one of mom's days in Paris on a train and all we could see on the other end was a little bit of the Palace grounds. Le sigh. One day I'll learn.